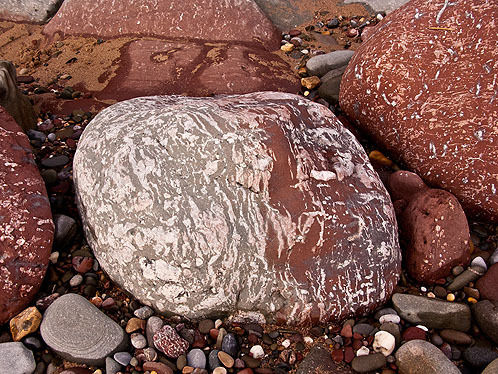 A boulder showing a variety of forms of Calcrete in the Old Red Sandstone at Freshwater East . There are extensive exposures of this rock type below the Cliffs on the East side of the Bay . In a process taking thousands of years , dissolved Calcium Salts are drawn to the surface by evaporatation , becoming concentrated on soil particles , as the interstitial soil spaces are filled, an impermeable crust is formed , creating irregular nodules. Calcretes can also form by a concentration of calcium around plant roots .